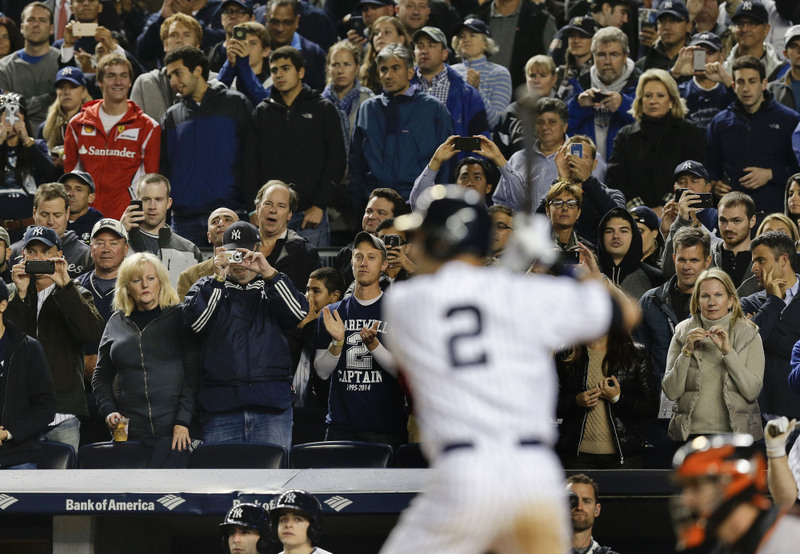 The captain's last stand at Yankee Stadium was in front of a packed house after a rainy day in New York. NEW YORK (AP) — As if on cue, the rain let up, a rainbow came out and Derek Jeter began his final home game with one more jolt. Jeter doubled off the top of the left-center field wall at Yankee Stadium in his first at-bat Thursday night against the Baltimore Orioles. “Did you expect any less?” former teammate Andy Pettitte said. With a packed house cheering his every move from the moment he ran out to stretch, and some tickets going for $10,000 each, Jeter’s farewell in the Bronx began on time after a dreary day. The retiring 40-year-old New York shortstop waved to fans in the box seats as he came to the on-deck circle in the first inning. After a standing ovation that lasted nearly a minute, he launched a long drive that just missed being a home run. Sitting in a suite, Jeter’s dad stood and cheered as the ball banged off the wall. The drive off Kevin Gausman, who was 4 when Jeter made his debut in 1995, was the 3,462nd hit of No. 2’s career, good for sixth on the career list. Jeter wound up scoring on a grounder as the crowd roared once again. “It didn’t surprise me,” Pettitte said on the Yankees’ telecast. The final player to wear a single-digit number for the Yankees was coincidentally playing his final home game on the 46th anniversary of Mickey Mantle’s last game in the Bronx, played across the street at the old stadium. The Yankees showed several tribute videos to Jeter on the center field video board and Led Zeppelin’s “Ramble On” played just before gametime. Many other former teammates gave video tributes between innings. The captain led the team out of the dugout — as usual — and the cheering began in earnest — rarely letting up when Jeter was on the field. He took several deep breaths when he settled in at shortstop and waved to the crowd before the first pitch. Not everything was perfect for the player with a charmed 20-season career and five World Series championships. The Bleacher Creatures roll call was interrupted just as they got to a thunderous chant of “De-rek Je-ter!” That’s when Baltimore’s Nick Markakis led off the game with a home run, but Jeter still waved to the crew out in right-center field. Alejandro de Aza nearly silenced the crowd by connecting again. But as they have throughout the Yankees’ final homestand, nearly 50,000 fans stood in unison, with their camera lights shining and began cheering as a recording of longtime public address announcer Bob Sheppard’s introduction of Jeter played ahead of his first at-bat. Jeter grounded to shortstop to end the second. In the field, he made a nifty grab to start a double play – with help from replay review. He ranged behind second base to field Adam Jones’ bouncer and flipped to Stephen Drew to start the turn. Jeter later made a throwing error and struck out. Tickets on the secondary market for home game number 1,391 of Jeter’s career were going for almost $250 in the bleachers and up to $10,000 in section 19, right next to the Yankees dugout. The packed house included Pettitte and stars such as injured New York Mets ace Matt Harvey. There was interest around the world, too. Japanese Prime Minister Shinzo Abe sent Jeter his best wishes. “I would like to pay my most profound respect to Mr. Jeter, retiring this year, for many years of fantastic play in the ballpark,” he said. Jeter arrived at the clubhouse pulling a suitcase about 3 1-2 hours before the start time. He was greeted at his locker by nearly 100 media and answered questions for about 8 minutes without revealing much about his mood. “It’s tough for me to start getting all emotional and sentimental before I got to play. Why don’t we play the game first?” he said. The Yankees have been eliminated from postseason contention, and Jeter wouldn’t talk about his plans to play at Boston this weekend in the last three games of the regular season. Manager Joe Girardi had not planned how he would orchestrate Jeter’s departure from the game, saying he would leave that decision until the last moment as he did with Mariano Rivera last season. “It’s the memories, not the momentous,” said Girardi when asked if he will keep something from the game. Mementos should be easy to come by. Major League baseball had five authenticators on hand as opposed to the usual two for a regular season game. The ball Jeter hit for a double was immediately taken out of play. AP freelancer Scott Orgera and AP Sports Writer Mike Fitzpatrick contributed to this report.